MUMBAI, India (CNN) -- Inside the blacked-out Taj Mahal Palace Hotel, hallways were littered with bloodied bodies. 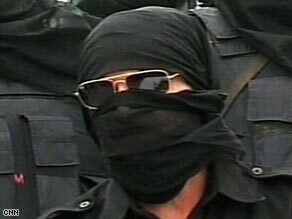 A commando in disguise give details of what went down in the Taj hotel when commandos went in. Terrorists were still holding 200 people 33 hours after the assault began. Knowing next to nothing about what they might encounter in the dark recesses of the hotel, Indian Army commandos decided to go back in -- and were met by terrorists firing mercilessly, throwing grenades and continuously switching positions. The sound of gunfire and explosions reverberated throughout the hotel's atrium, making it impossible to pinpoint the origin of the shots. Through it all, the commandos walked down pitch-black halls, trying to navigate the damaged hotel without knowing the layout. A commando spokesman, his face and hair swathed in a black scarf and wearing dark glasses to hide his identity, revealed these details of the mission inside the Taj at a news conference Friday. When the gunfire stopped, commandos -- known as the Black Cats -- entered the room and freed all 200 hostages. Their difficulties had been apparent from the beginning, he said. "Then we heard gunshots on the second floor and we rushed toward the fired shots," he said. "While taking cover we found that there were 30 to 50 bodies lying dead. At that point we also came under fire. The moment they saw us, they hurled grenades." "At that time, they vanished ... they had gone elsewhere," the commando said. The attackers had a clear advantage, commandos said, because it was apparent from their movements they knew the hotel's layout. Some tourists rescued from the hotel said the building's large dome and a massive atrium made the sounds of gunfire and explosions reverberate endlessly. It was impossible to pinpoint where the shooters were. Because of the darkness, commandos could not tell how many terrorists were there -- were there many, or only a few who continued to change positions? At one point, commandos believed some of the terrorists were hiding on the eighth floor. As the commandos approached one of the rooms, attackers opened fire at them and said all the people in the room were dead. During the fight, two commandos were shot. They decided to flush out the terrorists by blocking entry and exit routes. But the attackers knew all the doors, he said. When they made it inside the room, the terrorists had disappeared again. Inside that room, commandos found AK-47 ammunition rounds, including seven magazines fully loaded, and 400 other rounds for other weapons. They found grenades, credit cards, U.S. notes, foreign money and bags of dried fruit, which they believed helped sustain the attackers during the siege. During the three-day assault, the attackers fired indiscriminately. But the commandos were forced to use caution. "Let me tell you one thing," the commando said. "Within the first exchanges of fire, we could have got those terrorists -- but there was so many hotel guests -- there were bodies all over and blood all over. And we were trying to avoid the causalities of civilians. We had to be more careful in our fighting." In trying to rescue hostages and trapped civilians, commandos had to convince guests they were there to help, not terrorists trying to trick them, Indian Army Lt. Gen. Noble Thamburaj said. "There are a number of rooms that are locked from inside," he told reporters. "It is possible that some of the hotel guests have locked themselves in and for their own security and safety. Even though we have identified ourselves they are not opening the doors." The overall operation may have been made more difficult because of a late start, CNN sister station CNN-IBN reported. CNN-IBN said that attacks at the Taj Mahal Hotel were well under way at 9:30 p.m. Wednesday, but unnamed sources said the commandos were not given the go-ahead to take part in the rescue until midnight. Those sources told CNN-IBN said that once the commandos got the go-ahead, it took nearly three hours for them to leave for Mumbai from their undisclosed location. Once they arrived, the sources said, commandos had no precise maps of the hotel layout or its access points. While local police and other officers were at the scene, the sources said, the commandos and army special force units are the only ones equipped and trained to rescue hostages.